Catch and release is a practice within recreational angling intended as a act of conservation. 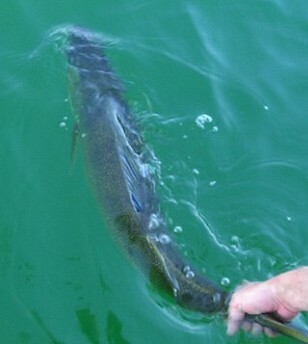 After a fish is caught it is unhooked and returned to the water before exhaustion or serious injury. The history of catch and release dates back to more than a century ago in England, preventing targeted species from being eliminated in heavily fished waters. Early in the 1950’s catch and release was first introduced in the U.S. as a fish management tool in the state of Michigan for hatchery raised trout. Anglers accepted the idea fishing for fun rather than food. In Canada catch and release is mandatory for some species and require the use of barbless hooks to facilitate release and minimize injury. Today catch and release is practiced by most all anglers, fishing guides, and promoted by fishing based organizations for Muskie, Walleye and Bass ensuring healthy fish populations for the future. Fish with appropriate rod, reel and line for the species of fish your targeting. When catching a fish you want to minimize the fight time. The greater the time playing a fish the more lactic acid build up and exhaustion sets in for survival. If fishing in cover (weeds) or warmer water use a heavier line than normal to reduce stress for the fish. Always carry needle nose pliers, hookouts, jaw spreaders and a small bolt cutter for larger fish. When landing a fish leave the fish in the water for the unhooking process to avoid any handling, if lip hooked a simple flick of the needle nose pliers should remove the hook. If a landing net is used, leave the net in the water when removing or cutting hooks. If the fish has multiple treble hooks embedded from a artificial lure, use the bolt cutter to cut the hooks, replacement hooks are inexpensive. If the hook is lodged deep in the gullet, never pull on the line or try to rip a hook out. Cut the line as close as you can to the hook or the hook itself. Jaw spreaders come in very handy for larger game fish aiding in the cutting or removal of hooks. All quality net manufacturers today have catch and release nets in their product lines. When selecting a net, hoop size, depth of net bag and type of mesh need to be considered for practicing catch and release and the assurance of fish survival after releasing. Using a larger hoop size and deep net bag will reduce the margin of error during the netting process and the extra net bag depth will allow for a portable live well during hook removal. The type of netting (mesh) is important in reducing the removal of the fishes protective slime layer while the fish is in the net. Today there are soft micro fiber knotless mesh, ideal for trout, bass and walleyes. Rubber mesh is an elastic soft molded rubber also used by bass and walleye anglers. Dip treated extra strong knotless mesh with a protective coating is used for musky, pike, salmon and large catfish. Use barbless hooks for quick easy hook removal and reduced handling times. Some anglers believe that using barbless hooks will cause too many fish to escape. When fishing barbless hooks concentrate on keeping your line tight while fighting a fish. You’re catch rate with barbless hooks will be as high as those achieved with barbed hooks. Barbless hooks can be purchased from several major manufacturers or can be created from a standard hook by crushing the barb(s) flat with needle-nosed pliers. Avoid touching the fish with dry hands or putting them down on dry surfaces ( boat gunwhales or boat bottom, docks, shoreline rocks and sand) Dry hands and surfaces removes the scales and protective slime layer leaving the fish vulnerable to fungal skin infections. Only touch fish with wet hands or using a wet towel. Never hang a fish from their jaws/mouth/gills vertically. Hold all fish horizontally and support as much of its body as possible to avoid injuring its internal organs especially larger fish. Learn the proper hand placement for holding fish under the jaw bone not in the gills. If you never held a large fish have a experienced angler or fishing guide show you, or have the guide hold your fish for the photo. When you catch that trophy fish and your desire is to release it to fight again, but you wish to have the measurements for a fiberglass replica here’s what to do. If possible measure the fish in the water using a floating ruler or a tailor’s tape. Measure from the tip of the nose to the tip of the tail and around the girth of fish at the widest point of body. If you’re bringing the fish onboard for a measurement using a bump board (ruler with a stopper at one end) wet the ruler before you use it. The time for measuring and photo’s should be minimized to under 25 seconds. For the sake of survival of the fish we discourage the use of conventional scales where the fish is hung by the jaw for weighing the fish to be released – it can damage the jaw or gills and places extra stress on the backbone and internal organs of the fish. Place the fish gently back upright in the water, holding the tail and supporting it’s weight by placing your hand under the belly, gently roll the fish side to side allowing it to get its bearings and catch its breath until it is fully able to swim off under its own power. If current is present it is important to face the fish into the current thereby allowing fresh, oxygenated water through its gills. Do not try to release or revive a fish using a thrusting forward/backward motion, the backward motion will suffocate the fish. The following few tips will help you take better pictures the next time you go fishing. Before lifting the fish out of the water, have your camera turned on and ready to shoot. Don’t hurt the fishes chances of survival by keeping it out of the water for too long. Shooting angles, always have the sun behind the photographer, natural sunlight provides the best light with rich warm uniform colors and tones. Always use the fill flash, even during mid day when the sun is at it’s peak. Using fill flash will add light to shadowy area’s of your photo. Push back the hat and take off the sunglasses to remove the shadows hiding the anglers face, and remember that SMILE! Take a few photo’s to ensure that you get at least one good shot.